Sloths are medium sized mammals which are covered with brown fur. They have short flat heads with big eyes, short snouts and tiny ears. Their legs are quite long, with long, curved claws. They have stubby tails. 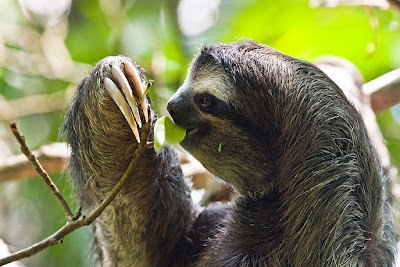 Sloths claws are also their only natural defense against predators. Sloths move only when necessary and even then very slowly, because they only have about a quarter as much muscle tissue as other animals of similar weight. Sloths are part of the order Pilosa so they are related to anteaters and armadillos. Sloths are found mainly in South America and Central America. Sloths are for the most part vegetarians. They eat leaves, buds and tender shoots. They also occasionally will eat insects, lizards and dead animals. Sloths are omnivorous animals. Sloths live in woods in trees. Main predators of sloths are jaguars, harpy eagle and snakes. Sloths can sleep around 10 hours a day. Sloths move very slowly and as little as possible. They slow movement and unique thick fur make it a great habitat for other creatures such as moths, beetles, cockroaches, fungi, and algae. Sloths spend most of their time hanging upside down. Their long, curved claws allow them to hang upside down from tree limbs.